I'm a little late to the Bob Goff party. But, from what I know about Bob after hearing him speak, meeting him a couple of times at the IF: Gathering, and reading his book, I don't think he would like me saying, "The Bob Goff party," and then I think he would tell me I'm right on time. Many of my friends have read Love Does, and they've told me how much they enjoyed it. But, I'm not sure I would have been able to say, "I enjoyed it" if Bob hadn't wrapped it up beautifully in the end. It was an easy read concerning his style of writing. His stories made me want to turn each page. The way he strings words together creates beautifully organized whimsey. But, I have to say the actual content was getting to me, stirring me up a bit, making me ask the question I often ask myself: What in the heck am I doing with my life?!? Jumping on planes to teach his kids about leadership and friendship, inviting John Ashcroft to be part of changing lives, starting schools in another country, freeing children from wrongful imprisonment, and so many other cool things. Bob Goff has been a busy man! Now don't get me wrong, it is apparent he is a humble leader and an excellent story teller. He would never have written these anecdotes to guilt anyone into doing anything. He simply wrote out some beautiful life experiences to challenge us all to love people like Jesus loves people. But, I have a problem. I've written about it so many times on this blog. Reading books by people who are changing the world in huge ways, or watching a TED talk by Gary Haugen, International Justice Mission's president, or reading biographies of people like William Wilberforce creates a fuzziness in my heart, and I start to lose focus on what God has asked me to do. I even had a teary conversation with Chad about it at lunch today. I say things like, "If violence is the cause of poverty, what in the world can I do/am I doing to help break the chains of oppression??" Chad is so patient with me and my passion. Tonight as I finished the last chapter of Love Does, my heart beat the words in my chest, "What do I do now?" Bob Goff must have known I would ask that question, and in the second sentence of the epilogue he said he would be asking the same thing if he finished reading a book like this one. And then he told me to figure out the next step, and then do that. Do you know that is the exact same thing I heard at the IF: Gathering in February? My big picture mind and heart can so easily get lost in the forest, meanwhile, I need to remember I've been on a rigorous, beautiful hike in the trees investing in women for quite sometime. I would like to believe I've learned great things about loving people the way Jesus loves people on this hike he's mapped out for me. It's funny really. In reading/watching great work like this, my heart and mind swell with zeal, passion, and fervor for charging the hill. And then God whispers in my ear, "Keep going, don't quit, take the next step." These sweet words destroy the let down from the potential lies I tell myself I'm not doing enough. Instead, I'm given sweet contentment and direction. To enter, leave a comment about a next step God is asking of you in your journey of faith. Be specific or broad, but make sure it isn't too 'Christian-y'. I want to hear your real words from your real heart. I'll draw a winner in a week or so. In what ways are you being challenged to put action to your love for people? What is the next step you will be taking in your faith journey? Do you plan to read this book? Do you want to win this book? Leave some comment love. Many blessings to you as you pour out the love of Christ on those you encounter today! I share your struggle. Someone asked me recently if I want to go on international mission trips. Of course I do! But I'm having to learn to be content in this season of three littles and #4 on the way and accept the fact that going to the nations isn't feasible right now, but that doesn't mean I'm out of the game. My next step is to keep walking how I'm walking . . . teaching women the Bible, investing in young married couples, discipling my kids, and sharing the Gospel as I go about daily life. In the past couple of years, since I've really started following Jesus, I've seen God strip things from my life to increase my dependence on him. I feel like the next step in my faith journey is God doing the opposite--he's placed many good things in my life (incredible community, true friends, a secure job, a wonderful fiance, to name a few) and is asking me still to keep him as my focus. It's been harder than I would have thought to rise to the challenge, and I've fallen short a lot. Even so, God reminds me again and again, that as good (and from him) as those things in my life are, he is better. He is the point of it all. I can't say that realization always travels from my head to my heart, but I'm working on it. As always, thank you Angel for sharing what's on your heart! Lately I have been challenged to go deeper with new relationships. In my flesh I am so comfortable with the friendships I have and the community I do life with, but in my spirit God is stirring me to enlarge my borders and let others in. As I begin to do this I am realizing that where I thought I was sacrificing or losing "my time" I am actually gaining and being enriched by these new relationships. This prompting to dig deeper and invest in new relationships has also exposed the fear that I have of being hurt because of recent experiences where that was evident. Sometimes leadership can leave me feeling like a walking target for assault, but in that I am learning so much about God's mercy and how He leads me to be renewed by and through him and to not make agreements with myself about not letting others in. Thank you for this post. I am looking forward to eventually reading this book. Love this and love that book. "My big picture mind and heart can so easily get lost in the forest, meanwhile, I need to remember I've been on a rigorous, beautiful hike in the trees investing in [people] for quite sometime." This quote of yours just spoke straight to my heart and I'm so with you! Thank you for the encouragement, dear. I hesitated leaving a comment because I really didn't know what to say. 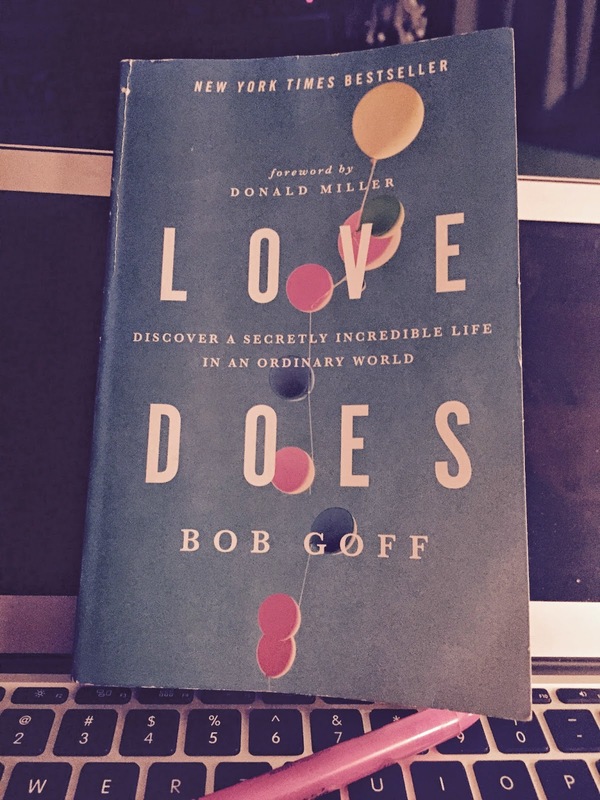 I only recently even heard of Bob Goff but sounds like another good read. I am still feeling small in the big world. Hard to know where to even start! Right now I know God is asking me to open my home. Still looking for answers of what that means and who I will open my home to. Who doesn't want to win a free book and by Bob Goff!! Good stuff of course my friend. So often I soak in books and blogs and I find myself asking that question what can I do, what next. And then life gets busy. Lately, I feel God has been reminding me it's not about what's next but right now and how can I love and serve now. I always want to make things bigger sometimes and really God just wants us to love and be obedient in his calling. Grateful for you and your wisdom and your sharing heart. Love you!! I loved reading this book! Loving others with such intentionality can be messy but it can also be fun and life-giving. I'm learning about what this looks like, especially intentional actions, as I add responsibilities to my plate and experience life transitions. I've been a mom now for a whopping two weeks, but already God has made it evident that he will open new doors for new relationships through David's birth. I've already seen the potential for relationships with other new moms (mostly in a breastfeeding support group I've been attending) and ways to love and encourage them, even in my many moments of struggle. I am praying that God will already begin to open doors in Colorado for our family and that we would trust completely in Him through so many big life changes and new challenges. What I love so much about Bob Goff is that he lives with intentional spontaneity. Sometimes I feel as a "P" and someone who likes to be spontaneous that all the "J"s around me are getting more done and serving God and people better because they have a plan. This book helped me see a good example of someone who lives intentionally, mindfully, and observantly without mapping it all out. He listens for God and obeys. God continues to show me that he can use me as he made me and that I don't need to compare myself to others to try to figure out how to be "more effective." I'm not sure what my next step is right now. There are some work relationships I'm trying to pursue and I know I need to be digging in deeper w/ God. Mostly, I'm trying to focus on being observant to people around me and obey when I feel the nudge of the Holy Spirit. I had never heard of Bog Goff until the IF gathering or so I thought. My sister went to a conference to hear him speak and told me how wonderful he was years ago. I should have listened then. But in my stubborness I am just "hearing" about him for the first time. When I think about putting my love for people to action I think really close to home. Overnight we went from one kiddo to two. And the second kiddo talks and responds unlike the first one who is still discovering his sweet little hands. I have been really struggling to love these kiddos with grace, patience and understanding. I have been struggling to put God's parenting styles and love into action when it comes to my own styles. I have been finding myself irritable, short and rather unfun to be around. I think I really need to spend some time at home loving the people there for a little while. The next step for me is to do research. What exactly does God say about parenting, what lies am I believing about my own parenting and asking people who are great parents to teach and show me how with a humble attitude. I also just need to read some scripture on how God fathers me. If I win the book I will absolutely read it and then will talk to my sister all about it.